Webinar recording: Community forestry. Where and why has devolution of forest rights contributed to better governance and livelihoods? 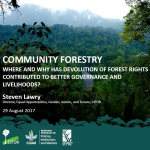 Our third webinar in the 2017 monthly series was conducted by Steven Lawry (CIFOR) on August 29. In his presentation, Steve summarized the findings of selected meta-analyses, presented case studies from Nepal, Guatemala, and Mexico, and previewed emerging research that looks at the investment effects of community forestry models that feature strong elements of forest rights devolution. See full abstract and presenter's bio here.